The two works gathered here were seminal in the development of Louis Andriessen and in the influence he had on the Dutch music scene. Hoketus was completed in 1977 and, in a time of still dominating serial avant-garde, that’s when and how repetitive minimalism made its breakthrough in the Netherlands. Scored for two groups of five instrumentalists (Andriessen leaves a degree of freedom in the lineup; here pan flutes, alto and tenor sax, Fender pianos, pianos and congas), it is based on hoquet effects, each group playing the same thing but staggered, and it sounds like repetitive pop music, exciting to the point of being high-strung and leaving the listener somewhat breathless. The liner notes claim that it was written for the same-named ensemble Hoketus that plays it here (which disbanded in 1986), but the story must be more complicated, because (thanks Discogs for making this information public) in the LP days, apparently in 1977, Donemus released a two-LP set, CV 7702 (not sold commercially, limited editon for subscribers only), with four work of Andriessen: De Staat (the recording of the world premiere with the Netherlands Wind Ensemble under Lucas Vis, 28 November 1976), Il Principe, Il Duce (an electronic work) and Hoketus, played then without the saxes, by an ad hoc ensemble in which Andriessen himself played one of the pianos. Five performers from then remain on the present version, one percussionist (Paul Koek), the two bass guitarists and pianists Cees van Zeeland and Gerard Bouwhuis. Andriessen is associated to minimalism but the picture is more complex than that. Although it uses some repetitive and hoqueting processes, Mausoleum (written in 1979 ad revised in 1981) is not really a repetitive/minimalist composition. Harmonically it is much more complex and rich than the trite and sentimental harmonic progressions often favored by the American minimalists. For 22 minutes (out of 34, in one track) it unfolds big imposing brassy pillars of sound, sounding very like Messiaen at times, very “primeval” always, announcing the big “blue columns” of De Tijd (Time), completed in 1981. Along the way the two high baritones sing vehementely about the anarchist Bakunin, in a language that is not comprehensible but appears to be Russian (texts not provided). It then recedes to a softer, quasi hymnal progression of the same material, rising again in a slow and implacable crescendo concluded by a new call from the baritones. Very strong piece, and an indispensable CD in the collection of the Andriessen follower. 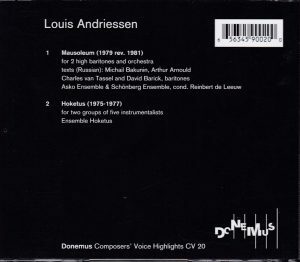 Note (and thanks again Discogs) that Donemus had published on LP (in 1986, judging from the label number) a previous recording of the same piece, CV 8601, with the Netherlands Wind Ensemble under Lucas Vis (recorded live 17 June 1979), paired with Andriessen’s De Snelheid / Velocity (same performers, live 6 June 1984), to the best of my knowledge none reissued to CD. TT 57:31. The disc must have been reissued a number of times: the first two barcodes indicated above are customary barcodes from Donemus; the last one, 656345900200, seems to be a one-off (I’ve found other Donemus publications starting with barcode 65634500 or 65634598 or 65634599, but none other with 65634590. But it’s not just some distributor’s barcode, it is the barcode on my own copy. The CD will be listed on commercial websites under either one of these barcodes.